Caring for your German auto starts with having an auto repair shop that understands the complexities of your car. Here at Ryan G. Motorworks, we will handle all your service needs, from electrical to mechanical repairs and services. As a German auto specialist, we know the ins and outs of the top manufacturers like BMW, Mini, Mercedes Benz, Audi, and Porsche. Our shop features the latest diagnostic equipment and specialty tools that ensure automotive services are performed to the highest standard. Keeping your BMW running as it should starts with proper maintenance. Each model has set intervals in which certain services need to be performed in order to keep the performance at the level as it was when it left the factory. Moreover, we have found that keeping up with BMW maintenance standards, in particular, most can expect significant longevity from their auto. Routine services, such as oil changes, tire rotations, brake inspections, and other crucial diagnostics help prevent breakdowns from occurring. Initial assessment of an issue and having an auto repair sooner, rather than later, will save you time and money on issues that could have been easily avoided. Staying on top of essential services ensure your high-end car remains reliable, fun to drive while avoiding costly repairs. Our promise to our customers is that they will receive the best service when visiting our shop and we will do everything we can to keep your car on the road for years to come. With German autos, it is somewhat of an art. They are more complex than some domestic models and require an automotive technician and specialist who knows what they are doing. So, don’t just let anyone do the repairs for your car. You don’t see your dentist about your knee pain, do you? Your car is no different! Leave it to the specialists who know and understand how your car should feel and perform to keep it running the way it should. Your auto requires scheduled maintenance to ensure it's running at its best. If your BMW or Mini is due for a routine service and you are looking for the right shop to take it to, look no further. At Ryan GMW, we perform all the necessary services your German auto requires including: oil services, inspection 1 & 2 services, fluid flushes, and all other scheduled BMW maintenance services. Skip the overpriced dealership; all your needs will be met here at Ryan G. Motorworks. Is your BMW not running right? Do you hear a strange sound your car has never made before? Or have a warning light on the dash? If your BMW or Mini is in need of automotive repairs, we can get it back on the road for you. Our shop can handle any repair needed. From radiators to water pumps, clutches to shocks, transmission or engine replacements, we are your one stop shop! Give us a call for a quote or to schedule an appointment. Ready to make upgrades to your BMW? Do you desire a different ride quality or are looking for more horsepower and torque from your stock motor? While BMWs are amazing rides from the factory, there is always room for improvement or modifications. Whether you are looking to simply upgrade your BMW or Mini Cooper’s suspension, or for a full-blown motor swap, look no further. 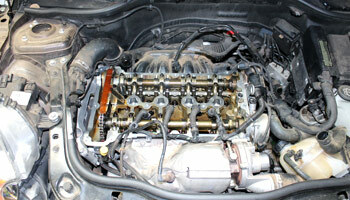 We have performed many swaps, from a 2002 with a 2.7i M20 to a BMW E30 M3 with a 3.2 S54 running full standalone. We also offer custom fabrication, from suspension retrofitting to wiring harnesses. If it hasn’t been done yet, chances are we can do it! Our modification abilities are second to none, our rates are competitive, and we strive to meet each customer’s specific needs. E-mail us for a quote, as each swap is unique and prices vary. We look forward to talking to you and making your automotive repair and services experience as pleasant as possible. Simply give us a call today at (530) 305-2499 for more information on Ryan G. Motorworks' automotive services.